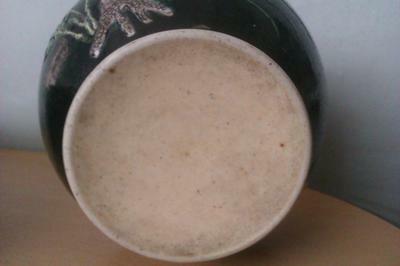 Many Song ceramics MUST have an unglazed bottom, otherwise they would be fakes, with some exceptions. The problem is that decorations on black like this didn't even exist until almost four hundred years later. This looks like enamel on black ground, which didn't really exist until the Kangxi reign in the Qing dynasty. But, by then all items of this sort did have glazed bottoms. Not to mention that decorations on black were rare at the time, and enamel decorations were still in their infancy then. The weight is one of the points that is considered with hands-on inspections, but your conclusion that copies are made of lighter material, usually, is faulty. Copies often come in more variations than the originals do. I suggest you find a Chinese porcelain specialist and have him/her do a hands-on inspection. This is more reliable than pictures. Thank you for your infomration. 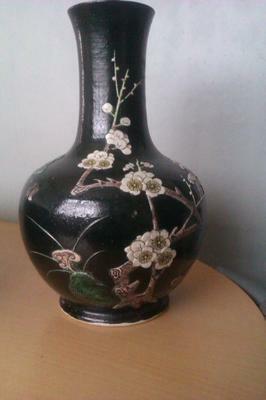 The reason that the base looks un-glazed is because the body is not glazed but seems to have been painted black or deep blue when originally made. 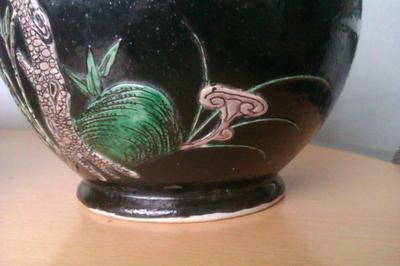 I have found vases like this that are said to be from the Song Dynasty. 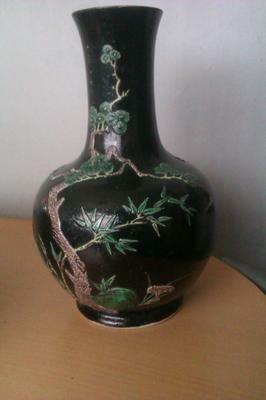 they also look un-glazed to the base.I do not think this is a modern reproduction as it is a very heavy vase and I would think that reproductions would be made of a lighter material. If the bottom is unglazed, then I think this is an item wanting to look antique, but that was actually made in the recent decades. Depicted are "Pine, Bamboo and Prunus (plum tree)". The snail-like part seems to consist of a stone (green) and a Lingzhi (fungus), which is one of the symbols of longevity. All of the above have some symbolic meaning in Chinese culture and appear frequently on art and craft objects.